2016 Tommie Award Silver Finalists! 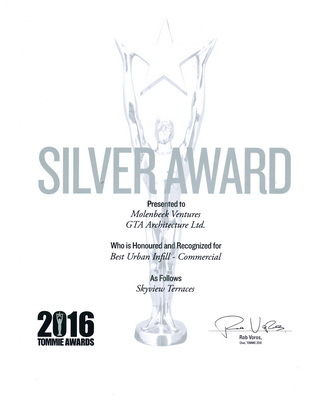 – GTA Architecture Ltd.
Molenbeek Ventures recently received Silver Finalist Awards for SICA Commercial Building Award Winning Project, Skyview Terraces! The Owner / Developers, GTA and the entire team are extremely proud and honoured to be heading to the Gold Awards Gala Event, hosted by the Canadian Home Builders’ Association, being held at the Delta Grand on January 30th, 2016. Skyview Terrace is designed with the trend-seeker in mind. 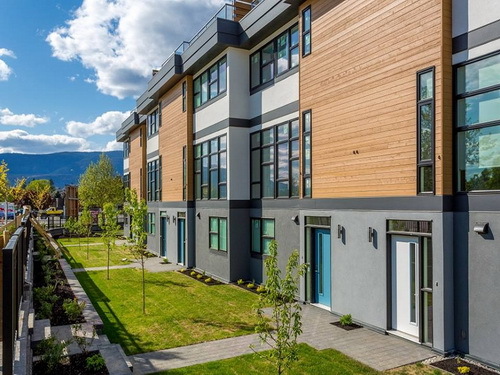 This European inspired community offers three levels of contemporary, open-concept and upscale living space. Nine foot ceilings, unique expansive windows which optimize natural light, hardwood flooring, high-end stainless steel appliances, roof-top patios with space for a natural gas barbecue and hot tub, geothermal heating and cooling, and open interior are just some of the many features that make this luxurious project unlike any other. Skyview Terraces received recognition for Excellence in Outdoor Living Space, Best Urban Infill, FortisBC Award for Building Energy Efficiency and Excellence in Semi-Detached or Town home Development. Good Luck to all of the finalists. We look forward to seeing you there!